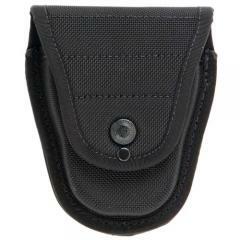 Keep handcuffs close and ready to use with the M82 Nylahide Duty Handcuff Case from DeSantis. Constructed from DeSantis' uniquely formulated Nylahide® material, the case offers superior durability unmatched by the competition. The key to Nylahide's® strength comes from its ultra-tough, polymer core. The hard, lightweight center offers superior rigidity for longer shape retention, resulting in a more secure fit and longer service life. The case is secured with a reinforced belt loop and rides close to the body to allow for quick and reliable cuff retrieval. The snap secured cover flap protects handcuffs from elemental damage as well as provides added retention strength.